My preschooler loves music–don’t they all at that age? But after eight weeks in Webop music class, Mooch now knows some basic jazz concepts that will help her learn an instrument, write music, or pursue whatever musical goal her heart desires later. The evening Webop class pretending to sing into a microphone with their teacher, Ms. Susie. Mooch was enrolled in Webop, a program developed by Jazz at Lincoln Center and brought to Omaha by Omaha Performing Arts. 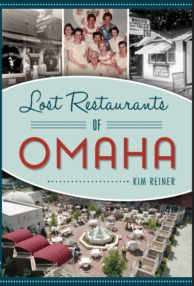 I used to work at OPA, and was so excited when I heard about this program starting up in my hometown. It’s phenomenal. Disclaimer: OPA offered my daughter complimentary enrollment so I could tell you about it. Band Week at the Webop music class at the Holland Performing Arts Center. For the last two months, we’ve sang, we’ve improvised with instruments and our bodies, we’ve listened to the best story times sung by our wonderful teacher, Susie (who’s a well-known vocalist in our city and beyond). I say “we” because parents or caretakers not only have to attend with their little one, they’re encouraged to participate. 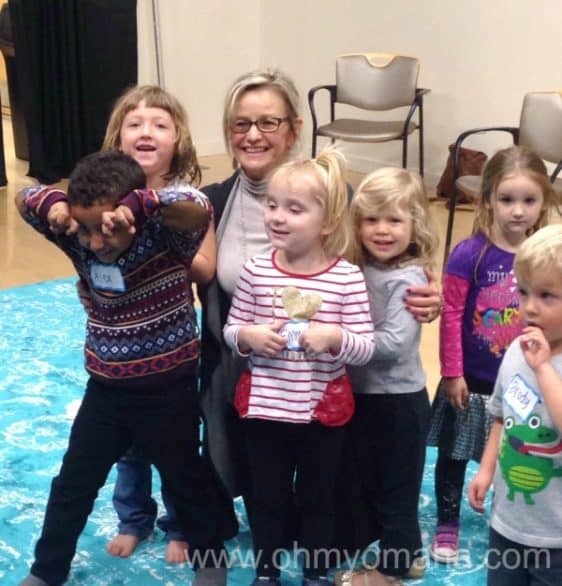 Ms. Susie with some of the Webop preschoolers at the end of their eight-week program. 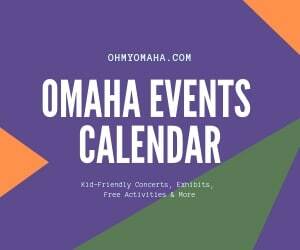 The program was created by Jazz at Lincoln Center and brought to Nebraska by Omaha Performing Arts. Every class had a pianist to accompany us and play the melodies, and twice, the class had a band. The kids learned about the instruments and enjoyed playing call-and-response games with the musicians. Sounds like a great program to you? A new session starts in the spring! * This is the class with our teacher, Ms. Susie. She was fabulous and my daughter adored her and pianist, Matt. Want to sign up for Webop? Sessions are eight weeks and cost $200 (there is a discount for second child in the same family). Get more program details and register online here! 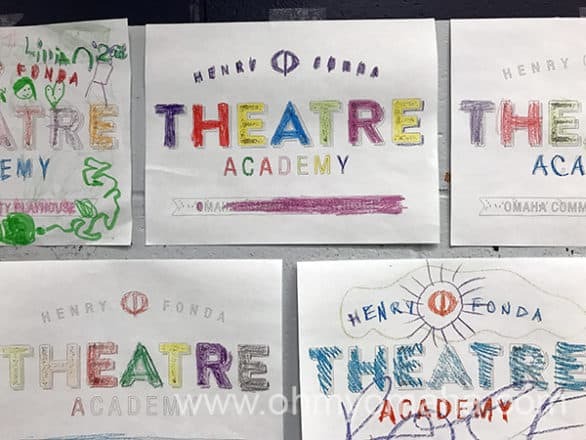 Note: Our class was a mix of 3- to 5-year-olds. It’s an interesting interaction with the older children taking the lead in the beginning, followed by the young ones speaking up more and more as the weeks progressed. Now, they’re offering classes that divide that age range into two separate groups. My tip for picking a class: Keep your child’s schedule in mind. 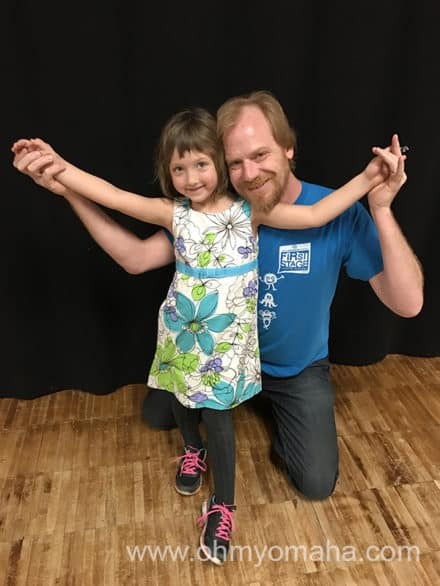 I signed us up for an evening class because we had soccer on Saturday mornings and I work full-time, so it it was our only option…but wow, 6 p.m. was a crapshoot if my daughter was in the mood to follow directions. Saturday morning’s would’ve been perfect for her. 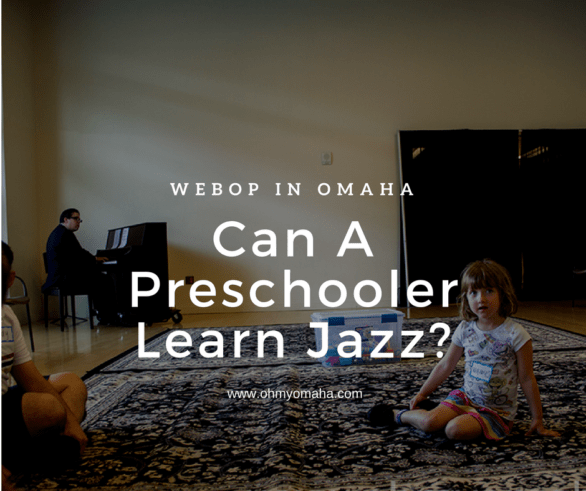 Can A Preschooler Learn Jazz? 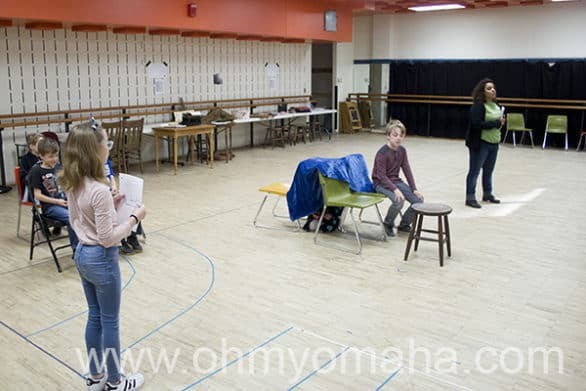 Disclosure: This post is sponsored by Omaha Performing Arts. All thoughts and opinions expressed here are my own and based on my family’s experience at WeBop. This post contains affiliate links. Oh My! Omaha is a participant in the Amazon Services LLC Associates Program, an affiliate advertising program designed to provide a means for sites to earn advertising fees by advertising and linking to amazon.com. I’ll be honest with you, I loved the premise of WeBop when I first heard it, but was a little skeptical about just how much learning a preschool jazz class could entail. I got my answer after the first session. We got home and my daughter insisted she needed to perform a concert before bedtime. 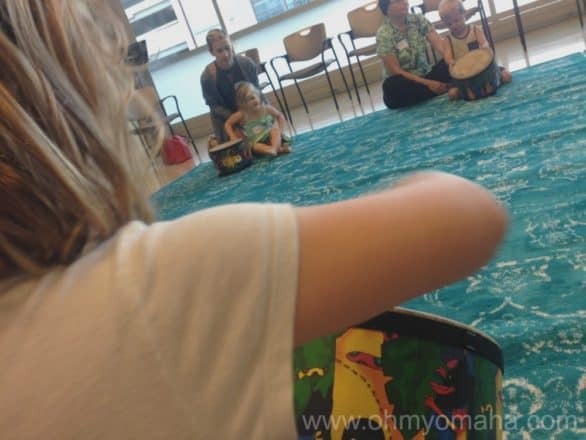 She recruited her big brother to play percussion on a pail. I had to pick a song from WeBop: A Family Jazz Party for them to play along to. Loudly. And apparently, she has band leader potential. Our late afternoon WeBop class starts off with playing along with a song using various musical instruments and call-and-response. 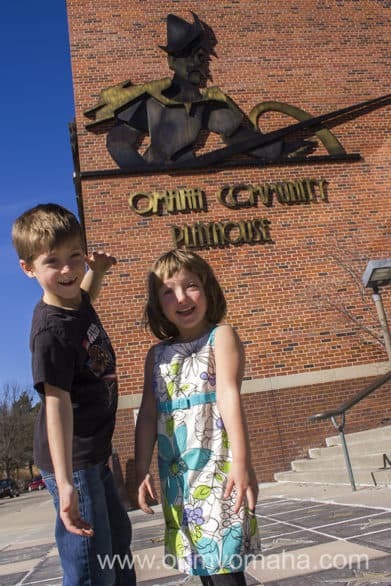 It turns out, my preschooler wasn’t the only kid in Omaha making music. Other classmates from her WeBop class have been composing – as only 3- to 5-year-olds could – their own music about playdates and dinosaurs. 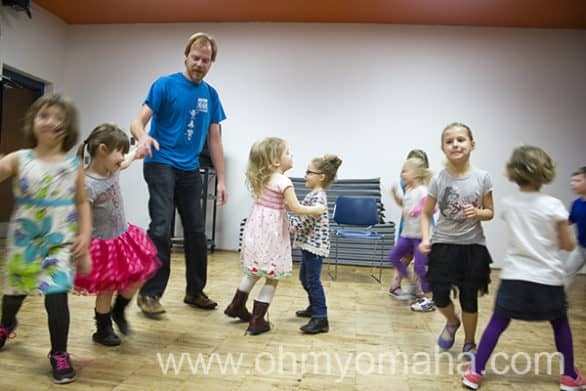 Omaha Performing Arts brought WeBop, a preschool program created by Jazz at Lincoln Center, to Omaha this year. This fall is the first session. 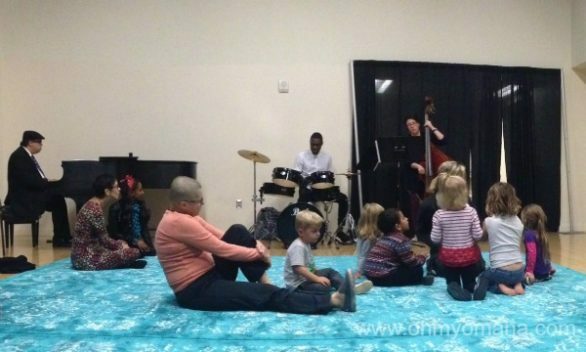 Parents attend and participate with their 3- to 5-year-old, learning about jazz through songs, dance, books and play. I go into detail about it in this post. We sing and dance a lot in class. 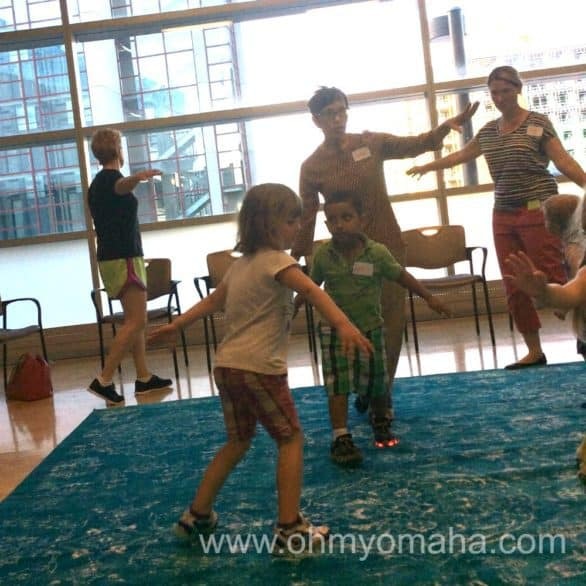 Since improvisation is a cornerstone of jazz, WeBop introduces it to preschoolers in a fun way – like making sounds and pretending to be an airplane. My son took this picture – you can see me in the background looking like an angry airplane with weak wings. 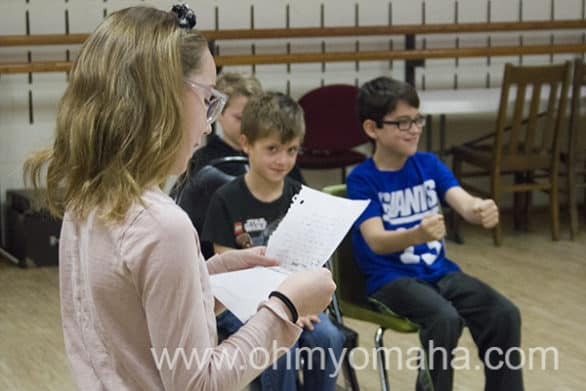 It’s a pretty cool experience partly due to the teacher, Susie, who happens to be a well-known jazz vocalist in Omaha (check out her allmusic.com page!). Accompanying her is Matt, a talented pianist. I’m sure he’s probably got an allmusic.com page too. Anyway. Susie sings, Matt plays, and we sing or play along too. The drums are a big hit every time they’re brought out in class. Each class so far has had a few minutes of drumming. Children may practice playing solo, improvising or copying what their teacher, Susie, plays. She bows after each song in class, people. It’s like she discovered the lure of the spotlight already. * The class is 45 minutes long, so toward the end of it, her love starts dissolving into a puddle. At our first class, parents were given a packet that included the curriculum for each week. In it, we were able to see which songs we heard in class, which book was read, and we were reminded which topic we covered (Week #1 – Swing, for instance). It also gave us tips to bring each lesson home. 1. Listen to jazz recordings and let your body swing to beats 2 and 4. 2. Sing a favorite book in a blues style. The fall session is in full swing. See what I did there? You can get class details here; I recommend starting from the beginning so your child gets the most out of WeBop. I’ll let you know when they announce the next session.